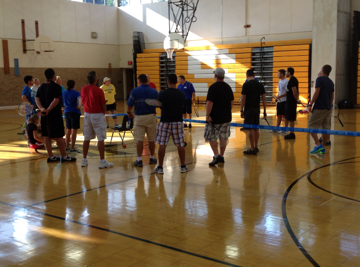 The Dearborn Community Tennis Association (DCTA) in conjunction with the Southeastern Michigan Tennis Association (SEMTA) and the Midwest section of the USTA brought a USTA Schools In-Service Physical Education Training to 24 Dearborn Public School elementary P.E. teachers. The program was put together in early September and was a big success, with leader Mike Andrews being very dynamic, stated DPS lead administrator Abe Mashhour. DCTA Executive Director Steve Behmlander kicked off the program which was led by Mike Andrews from Fort Wayne, Indiana. Mike represents the USTA Midwest section at various school training sessions and serves on the Midwest Youth Tennis committee. The goal is to bring tennis into the fabric of the districts curriculum during school and follow it up with an after school program or a lunch time program at all of the 22 elementary schools in the Dearborn. The DCTA is also working with DPS to refresh their equipment at the schools. This was the third in-service done for the Dearborn Public Schools through the DCTA in the last 5 years.